The start of a cricket game is actually 30 minutes before the first ball is bowled. The ritual of it has changed a few times over the years, but basically what happens is the captains walk out to the pitch wearing their blazers over their whites with an umpire and often a cameraman and commentator. The umpire gives the coin to the home captain who tosses the coin up in the air, and then the visiting captain calls heads or tails before the coin lands. The coin is left to land on the pitch, and then the captain who has won the toss is asked if he wants to bat or bowl. It's an old tradition. Using a coin to make a decision has been done for at least 2000 years. Using it in cricket has dated back to at least the 1850's (The toss result was recorded in the match between Oxford and Cambridge Universities in 1858). And yet there is now some calls for it to be done away with. The ECB are going to experiment with removing the mandatory toss for the 2016 County Championship season. There is a thought that the toss is too influential. There is a perception that there are too many matches where "if you win the toss, you win the match." Just over 50% of respondents wanted the toss to be done away with on an ABC poll. I remember having a conversation with a friend who is a fan of most sports, but he was sick of cricket because "the toss of the coin has too much impact." As a cricket statistician, this is wonderful, as it's something that I can test. What is the impact of the toss on cricket matches. How much more often does the team that wins the toss win the match? In all test matches, the team that has won the toss has won the match 749 times, and the team that lost the toss has won 671 times. These combined with 734 draws and 2 ties have meant that the team that wins the toss has won the match 34.7% of the time, and the team that lost the toss has won 31.1% of the time. This is a relative probability of 1.116. This means that the team that has won the toss has had a 11.6% higher chance of winning the test. This is slightly lower than I would have expected, but it's still a statistically significant difference. (Statistically significant is a technical term that basically means that we can say that we have enough evidence that there is a difference, and that it's unlikely to be just because of randomness). But if we delve deeper into these numbers, then some interesting things turn up. First lets break it up by home and away. This is an important distinction, as the home teams will generally be better at reading the conditions. I would have expected that winning the toss at home would provide a bigger difference than winning at home. It turns out to be so, but not by nearly as much as I expected. When the home team has won the toss, they've won 41.8% of the time (467/1117 matches), when the home team has lost the toss, they've won 37.9% of the time (394/1039). This is a relative probability of 1.103, or a 10.3% increase in probability of winning. There are different methods of testing for significance, and this is right on the edge of being significant or not. In other words, while there's a 10% difference, if we randomly selected the results, it would be reasonably likely that we would get this sort of difference. When the away team wins the toss, they've won 27.1% of matches (282/1039) vs 24.8% when losing the toss (277/1117). This is a relative probability of 1.094: away teams have won 9.4% more often when they've won the toss than when they've lost the toss. Again, there is a difference, but it's not statistically significant. The reason why it can be significant with the full group, but not with any sub group is due to the smaller sample sizes. The similarity can be represented fairly well graphically. The result proportions for home and away are very similar, regardless of who won the toss. Now at this point, I wondered if this was simply due to older tests, where perhaps there was less doctoring of pitches. It is an interesting idea that pitches are doctored more often now. I would have thought that if anything, the nature of pitches round the world is now more similar. Overall the team that has won the toss has won 260 out of 680, while the team that lost the toss has won 252. That's a relative probability of 1.032 ie. in the past 15 years, the team that won the toss has won 3.2% more often than the team that lost the toss. That's an almost negligible difference. Breaking it down to home/away it gets even closer. When the home team won the toss they've won 46.9%, when they lost the toss, they've won 46.9%. The difference is so small that you have to go to the 4th significant figure to be able to measure it. When the away team won the toss they've won 29.4%, when they lost the toss, they've won 27.4%. The relative probability is 1.072. Surprisingly this is much larger than the advantage for the home team, which suggests that the difference is just down to the effect of randomness rather than the effect of the toss. Again the similarity is remarkable. So, to assess our original question: does the toss have a major impact on the result of the match? No. Absolutely not. Winning the toss has historically only given teams an 11% higher chance of winning, and recently that's reduced to only 3.2% since the year 2000. 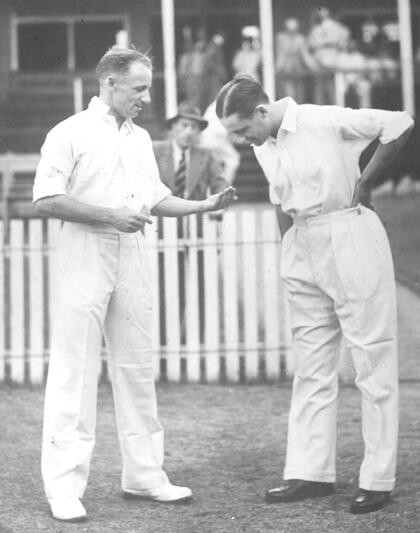 *picture of Bradman and Allen at the coin toss thanks to Wikimedia.